26 years ago, when the Replacements called it quits the first time, it was hard to know what to expect from any of the individual members. For a brief moment though, it was Tommy Stinson who looked like he might best carry the band’s torch. 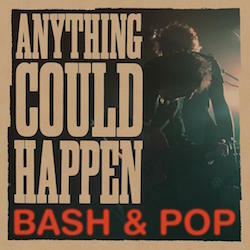 1993’s Friday Night Is Killing Me by his band Bash & Pop still holds up as maybe the most rollicking and rocking of any post-Replacements release. The band was short-lived, and Stinson was on to his next band in 1994, but that singular Bash & Pop album has held a place in the hearts of most deep fans of the Replacements since. Yet it came as somewhat of a shock, following the end of the Replacements’ recent reunion, that Stinson would announce he was releasing another album under the name Bash & Pop. While the band went through several members during its brief incarnation (and its sole album was recorded with a bevy of studio help alongside the band), original drummer Steve Foley’s death, and the fact no other original members would be involved, would seem to preclude the use of the name. And yet…here we are, and Anything Could Happen is the result. Whether it’s something about the Bash & Pop name or the fact that the two albums were recorded following the demise of relationships (The Replacements, the former; Stinson’s marriage, the latter), the new album joins its predecessor as some of the best music Stinson has recorded outside of the Mats. The energy is inherent from the get-go with opener “Not This Time” comprised of a ripping slide-guitar that carries its fast-loping beat before settling into “On the Rocks,” a song that sounds like a time capsule from the first Bash & Pop outing. While there are a number of songs that match that feel, much of the album sounds like a true successor rather than a replication. Starting with the title track, the album takes a spin through a set of songs that carry their fair share of emotional weight. The lovely “Breathing Room” is one of the finest examples of this, a thoughtful and soft examination from the inside of a relationship falling apart that manages to be both honest in its exhaustion, but sympathetic to the other party in a way that often goes unexplored.